Have you always been interested in American Football, yet not able to play? The Giants present you with a perfect opportunity to follow this beautiful game up close, join the Giants Family and even get paid a hefty €75,00 each game! We are looking for Football enthusiasts to become referees for the Dutch American Football League (AFBN). No experience is needed at all. A referee crew consists 5-7 persons per game and works together as a team with each their own responsibilities. The Giants will pay for your full certification costs and the two-day clinics are held on February 9th and 10th, 09:30-17:00. 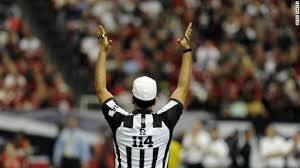 Games are mostly held on Sundays and you will officiate about 8 games a year. As a bonus, we will also supply you with the essential referee outfit at no costs for you. There are basically only benefits! Next Groningen Giants zoeken jeugdspelers!